The Albanian Fascist Party (Albanian: Partia Fashiste e Shqipërisë, or PFSh) was a Fascist organization active during World War II which held nominal power in Albania from 1939, when the country was conquered by Italy, until 1943, when Italy capitulated to the Allies. Afterwards, Albania fell under German occupation, and the PFSh was replaced by the Guard of Greater Albania. On 25 March 1939, Italian dictator Benito Mussolini gave Albanian King Zog I an ultimatum demanding the acceptance of an Italian military protectorate over Albania. When Zog refused to accept, the Italians invaded on 7 April, and deposed him. Zog subsequently fled the country. Afterwards, the Italians re-established the Albanian state as a protectorate of the Kingdom of Italy. 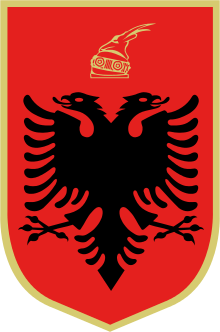 On 11 April, Italian Minister of Foreign Affairs Galeazzo Ciano arranged for a group of well-known Albanians to "request" the formation of the Albanian Fascist Party (Albanian: Partia Fashiste e Shqipërisë, or PFSh). By the end of April, the government of Italy approved of its creation. On 23 April, Italian Fascist Party secretary Achille Starace, accompanied by two Italian warships, arrived in Albania to officially announce the establishment of the PFSh, which was founded on 2 June. However, it did not receive its constitution until 6 June, and was not presented with an organized directorate and central council until March 1940. The PFSh enacted laws that prevented Jews from joining it and excluded them from professions such as education. Composed of ethnic Albanians and Italians residing in Albania, the party existed as a branch of the Italian Fascist Party (Italian: Partito Nazionale Fascista, or PNF), and members were required to swear an oath of loyalty to Mussolini. All Albanians serving the Italian occupiers were required to join it, and it became the only legal political party in the country. ↑ Bideleux & Jeffries 2007, pp. 30–31. 1 2 Fischer 1999, pp. 21–57. ↑ Lemkin 2008, p. 99. 1 2 Fischer 1999, p. 45. ↑ Elsie 2012, p. 426. ↑ Frank 2010, p. 97. ↑ Fischer 1999, pp. 45–46. ↑ Lemkin 2008, p. 102. ↑ Bideleux & Jeffries 2007, p. 31. Bideleux, Robert; Jeffries, Ian (2007). The Balkans: A Post-Communist History. London: Routledge. ISBN 978-0-203-96911-3. Elsie, Robert (2012). A Biographical Dictionary of Albanian History. London: I.B.Tauris. ISBN 978-1-78076-431-3. Fischer, Bernd Jürgen (1999). Albania at War, 1939–1945. West Lafayette, Indiana: Purdue Research Foundation. ISBN 1-55753-141-2. Frank, Chaim (2010). Petersen, Hans-Christian; Salzborn, Samuel, eds. Antisemitism in Eastern Europe: History and Present in Comparison. Bern, Switzerland: Peter Lang. ISBN 978-3-631-59828-3.